Generate business value by enabling greener, healthier and more sustainable lives. That’s the promise of this tool, developed from over 50 case studies and a series of global workshops with leading brands, led by BSR and Futerra. Our Sustainable Lifestyles Frontier Group revealed six steps to building a business case for consumer behavior change. Making the case for enabling sustainable lifestyles demands strategic organizational fit, precedent and effective tactics. Find all three in the tool below. Then add your case study to this growing bank of learning. If we had 10 more case studies, we’d have a much stronger tool. If we had 100, we would have the definitive business case for sustainable consumption. So get involved. 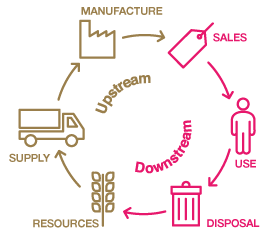 The business case for ‘upstream’ sustainability is becoming widely accepted. Changing consumer behaviors ‘downstream’ has become popular, but the ROI is murky. This means many sustainable lifestyle initiatives stay in ‘pilot purgatory’ and never reach scale. In 2013, we surveyed over 50 companies about sustainable lifestyles. The majority expect sustainable lifestyles will deliver growth, innovation and sales within five years. They also said the biggest barrier holding them back was the lack of a business case. That’s why we’ve made this Business Case Builder. Identifying your business’ most significant impacts on society and the environment. Traditionally identified through a materiality process. Determining the role consumers play in that. Find this through a lifecycle assessment. Identifying the right behavior won’t always be straightforward - complications and conflicts will arise. For example, packaging waste might be a relatively small part of your overall footprint, but a hugely visible problem for consumers. You might choose your target behavior based on consumer perception, stakeholder importance or for competitive differentiation. All those are valid motivations, and should be stated upfront in your business case. This BETA version has four broad behavioral areas; with your help we can add more. The second step is to hone in on your business motivation. Every company seeks profit and ROI in different ways. Your business might be focused on brand differentiation, cost savings or driving innovation. While all these might be important, most businesses will focus their value creation (and internal messages) on one or two at any given time. Your business case must prove that consumer behavior change has a ‘strategic fit’ with the business value drivers your company is currently prioritizing. We have categorized the broad drivers of business value for this BETA version, each with a series of subcategories. The biggest factor in delivering value isn’t the behavior you choose to change, but the tactic you use to change it. By analyzing over 50 case studies we have discovered that certain tactics deliver certain types of value. Some are obvious, such as marketing campaigns delivering brand value. Use your behavioral area and business value driver to identify the tactics most likely to succeed, then move on to Step 4. A strong business case is built on solid evidence or precedent. Until now, this has been lacking for consumer behavior change. This BETA version provides the best publicly available case studies we’ve found. If we’ve missed a good one, please tell us. Download case studies below to move to Step Five. You must build value for the consumer into your plan. It’s the bedrock of your sustainable lifestyle business case, and often surprisingly hard to identify. The defining factor in the failed behavior change campaigns we investigated was that they implored, demanded or cajoled the consumer, but never offered them anything in return for changing their behavior. Your return on investment is based on their return on effort. Smart market research, crowd-sourcing ideas and pilot testing can help you discover which of these benefits your consumer will enjoy from changing their behavior. Also see the ‘consumer value’ sections within each of our case studies for precedent. Sprint’s Buyback program gives up to $300 credit to recycle old phones.Between 2001 and 2012, 40 million devices were collected. In 2012, they gave consumers $75 million. Sprint saved $1 billion. Levi’s Water<Less jeans are made with less water. Their consumers like to see themselves as changing the world. Tapping into this emotion has meant Water<Less jeans now sell faster than standard Levi’s jeans. 2007 was the start of the Prius sales boom. Research by CNW at the time found that 57% of Prius drivers chose the car because it ‘makes a statement about me’. You’ve got the right behavior matched to the right tactic, all designed to deliver the results your business values, and with clear consumer benefit. Now you need to activate your plan. 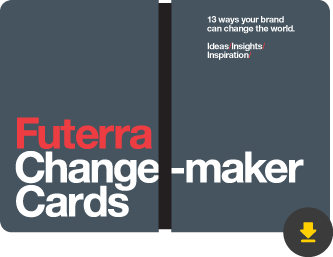 Futerra’s Change-maker Cards highlight the 13 best approaches and will help you create an activation plan. For some Working Group members, all they needed was a conversation with their Chief Financial Officer. Others had to submit their business case through a formal internal process. However you take your business case forward – good luck! More case studies. We can keep them confidential if needed; they’ll still help improve the analysis. Feedback. Is this Business Case Builder clear, did you use it and has it helped? Please help BSR and Futerra improve this tool. We’ll contact you by phone, email or skype if you can help. 50+ case studies that prove the value of behavior change. Due to confidentiality, we’ve only be able to include some of these. To all who responded to our survey, participated in the workshops, shared their insights in interviews and shared their business cases and case studies: thank you. A special thank you to those who made their case studies publicly available. The information presented within this tool was prepared by Futerra and BSR, and do not necessarily reflect the opinions of the individual participating companies. Jointly launched in April 2013 by Futerra and BSR, the Sustainable Lifestyles Frontier Group is taking the lead on accelerating this movement, learning from participating businesses on how to enable sustainable lifestyles across industries and around the globe. To join our group, please contact Elisa Niemtzow.